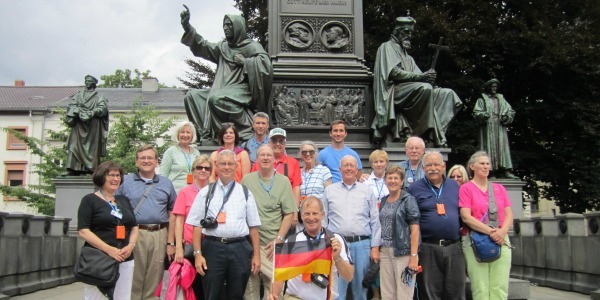 We are delighted that you are considering a tour with Reformation Tours. We are proud members of the National Tour Association and we hold $1 million in Errors and Omissions insurance, so that you are fully protected. PRICES: All rates quoted are per person, in US Dollars, based on two persons sharing a room. Single supplements are available where applicable. Rates are based on tariffs and exchange rates in effect at the time of printing and are subject to change without notice. Rates may be adjusted if tariffs or exchange rates are revised. Once your final payment is received at Reformation Tours, Inc., the land portion of your package price is guaranteed, however, airfares are subject to change by carrier at any time. DEPOSITS AND FINAL PAYMENT: A deposit of $350 per person (unless otherwise stated) is required upon registration along with a signed copy of the registration form. Registration by phone must be accompanied by a signed copy of the registration form. – Balance of payment, or final payment, must be received by Reformation Tours at least 75 days prior to tour departure. – Late registration (less than 75 days prior to tour departure) must be accompanied by full payment and is subject to late fees, or airline supplements. – Reformation Tours reserves the right to cancel reservations if deposit or final payment is not received by due dates and to apply the applicable cancellation penalties indicated below. – A $25 fee will be charged on all checks returned unpaid. PAYMENTS: Payments can be made by check (payable to “Reformation Tours”) or by credit card. A 3.5% surcharge applies to credit card payments. TOUR DOCUMENTS: Travel documents are sent approximately 3 weeks prior to departure provided full payment has been received. The package includes a full-color tour diary, name tag, travel wallet, air tickets and luggage tags. YOUNG TOUR PARTICIPANTS: Tour participants under the age of 18 years must be accompanied by an adult. They receive a discount on the land tour price when sharing a room with two adults, unless otherwise noted. On escorted tours and cruises, we discourage children younger than eight years because we have found that they are too young to enjoy these vacations. Reservations for children are acceptable, however they must be approved by Reformation Tours prior to booking. HOTEL ACCOMMODATIONS: If a change becomes necessary for any reason, hotels substituted will be equivalent of those on your itinerary. Single rooms are available at additional cost, as hotels do not typically give us a discount if there is only one person in the room. With few exceptions, all rooms offer private facilities. All tours have a specific number of pre-reserved allotments. In the event this number is exceeded, for any reason, we reserve the right to allocate part of the group in another hotel of similar standard. As a standard policy, hotels are not available for check-in before 2:00 p.m. Air conditioning is not standard in European hotels. TOUR MEMBERSHIP: In order to ensure congenial membership, Reformation Tours reserves the right to accept or reject any person as a tour participant and to expel from the tour any participant whose conduct is deemed incompatible with the interest of the tour group. AIR TRANSPORTATION: If the tour price includes round-trip air transportation it will be in economy class. Any cancellation, itinerary change or failure to use confirmed space will be subject to penalties levied by the airline at the time of ticketing. Airfare and airline schedules are subject to change without notice. If you prefer to use air miles, you are welcome to do so, but we ask that you wait until the tour is a guaranteed departure, in order to avoid penalties. FREQUENT FLYER MILES: Once you have received your air tickets, you can contact the airline for frequent flyer miles credit. This can be done by phone or in person at the airport. NOT INCLUDED IN TOUR PRICE: Unless otherwise noted in the tour description, foreign departure taxes, security taxes, port charges, park fees, U.S. Customs, immigration, agricultural, applicable passenger facility charges, and international transportation tax are not included. Tips for your tour director, tour driver, gratuities on cruise ships, are not included unless otherwise noted. Passports visas, laundry, beverages and food not on the regular table d’hote menu (these items will be billed to you before leaving the hotel or restaurant), as well as all other items of a personal nature. The above fees/taxes are subject to change without notice. REVISION FEES: A $35 per person service fee will be assessed for each change to a tour or air booking once deposit has been received, plus any additional fees that may be charged by our suppliers. Changes in departure date, itinerary or passenger name is considered a cancellation and a new booking. All changes and substitutions are subject to space availability, rates, discounts and booking conditions in effect at the time of the substitution or change. No change will be made unless permitted under the terms of our cancellation policy even if you transfer to another departure date. – Cancellation charges also apply to additional accommodation reserved prior to and after the tour. Reformation Tours cannot assume responsibility for any additional costs or fees relating to the issuance and/or cancellation of air tickets or other arrangements not made through Reformation Tours. TRAVEL & HEALTH DOCUMENTS: A valid passport is required for all travelers and it needs to be valid for six months after the return date. However, it is the sole responsibility of the passengers to check with the appropriate consulates and medical personnel to determine if visas are required and what health precautions and documents are necessary. The Operator accepts no responsibility for failure to notify travel participants of customs and immigration laws or health requirements. TRAVELERS NEEDING SPECIAL ASSISTANCE: Any disability requiring special attention must be reported to Reformation Tours at the time of booking. Reformation Tours will make reasonable attempts to accommodate the special needs of tour participants with physical disabilities, but is not responsible for any denial of services by carriers, hotels, restaurants and other independent suppliers. Motor coaches are not equipped with wheelchair ramps. We regret that we cannot provide individual assistance to tour members for walking, dining or getting on and off motor coaches. Motor Coach Company and other carrier employees may not physically lift participants or assist them on or off transportation vehicles. A qualified companion must accompany travelers who need such assistance. BAGGAGE: Porterage for one suitcase is included in tour price, unless otherwise specified. Due to limited coach capacity we strongly recommend each passenger to bring no more than one normal size piece of baggage and a travel bag. Extra baggage or excess weight will carry a surcharge and shall be paid as such to your tour manager. International air carriers may also impose fees for excess weight. No responsibility is accepted by Reformation Tours for loss of or damage to luggage or any other personal property. Travel insurance is strongly recommended. SMOKERS: Smoking is not permitted on transatlantic flights. We also do not allow smoking on the bus, in hotel rooms or during group meals. Reformation Tours, LLC, P.O. Box 854, Belleville, IL, hereinafter referred to as “the Operator”, acts as “agent” for you in making arrangements for tour services offered in this brochure, including transportation, sightseeing and hotel/lodge accommodation. The air carriers, hotels/lodges, motor-coaches and other suppliers providing tour services are independent contractors and are not principals, agents, employers, employees, masters, servants, representatives, partners or joint venturers of the Operator or its affiliates. The Operator is not liable for the acts, errors, omissions, representations, warranties, breaches or negligence of those independent contractors and is not liable for any personal injuries, death, property damage, or other damages or expenses resulting therefrom. Furthermore, the Operator is not liable for any act of God, acts of terrorism, war, defects in machinery, breakdown in equipment, weather, strikes, theft, change of fares or rates, delays or cancellations. All certificates and other travel documents for tour services issued by the Operator are subject to terms and conditions specified by supplier thereof, and to the laws of the countries in which the services are rendered. If the services included in the tour cannot be supplied or there are changes in an itinerary for reasons beyond the control of the Operator, the Operator will arrange for the provision of comparable services, when possible. Any resulting additional expense will be payable by the tour participants and any resulting saving will be refunded by the Operator to tour participants. No further claim for reimbursement shall apply. Reformation Tours reserves the right to accept or reject any person as a tour participant, to expel any tour participant from the tour, to make changes in the itinerary whenever the Operator deems it necessary for the comfort, convenience or safety of the tour participants and to cancel a tour at any time. Claims – In the event that any portion of the journey has not fulfilled your prior expectations, the claim must be filed within 10 days of the termination of your confirmed journey and return to your point of origin. The case will be reviewed and answered. Claims posted later than 10 days will be disregarded and considered unacceptable and will not hold the Operator liable in any way. The statements herein and the contract between tour participants and the Operator are made and entered into in St. Clair County, IL and governed by the laws of the state of Illinois. Each tour participant understands that the Operator will be accepting that participant’s booking in reliance upon such participant’s acceptance of the within Tour Conditions. No person, other than an authorized representative of the Operator by a document in writing, is authorized to vary, add or waive any term or condition in this brochure, including any term or condition set forth in the preceding provisions. Reformation Tours reserves the right to alter, adjust, modify or cancel any tour itinerary at any time without prior notification. Payment of the required deposit or any partial or full payment on a tour package constitutes consent to all provisions, conditions and general information contained in this printing.